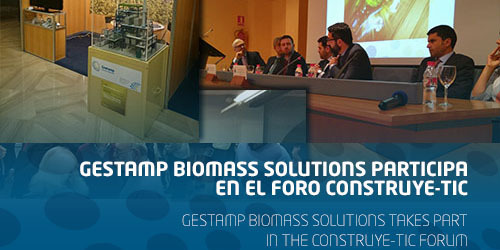 GBS (Gestamp Biomass Solutions) took part last 9th of November in the third edition of Construye-TIC. The event, held at the Congress Palace of Cádiz, presented the most recent updates on TIC deployment in order to enhance competitiveness on construction and development companies. Alejandro Páez Moreno, CEO of Gestamp Biomass Solutions, exposed about ‘R+D+i role in the creation of sustainable competitive advantages’, lecture from which he highlighted, amongst other ideas, that innovation and its proper management are key factors in order to enable a competitive advantage with regard to competitors and, subsequently, this happens by creating new values in the shape of products, services, processes and so on. Construye-TIC is yearly organized by FAEC (Federación Provincial de Agrupaciones de Empresarios de la Construcción de Cádiz) and Evolucionapp, an event that addresses the utilization of new technologies to boost the sector. The main objective of this experience is to carry out a pedagogical and awareness exposure about the usage and applications of TICs to solve sector’s problems.